Cheongdoeupseong functioned as the administrative and military center of the area and boasted government offices, a guesthouse in the center, a market near the west gate that led to Daegu, military facilities to the north, and granary or agricultural offices by the east gate.7 Today, nothing really remains of the fortress, though some stones were found when a reconstruction of the walls began in the mid 2000s. 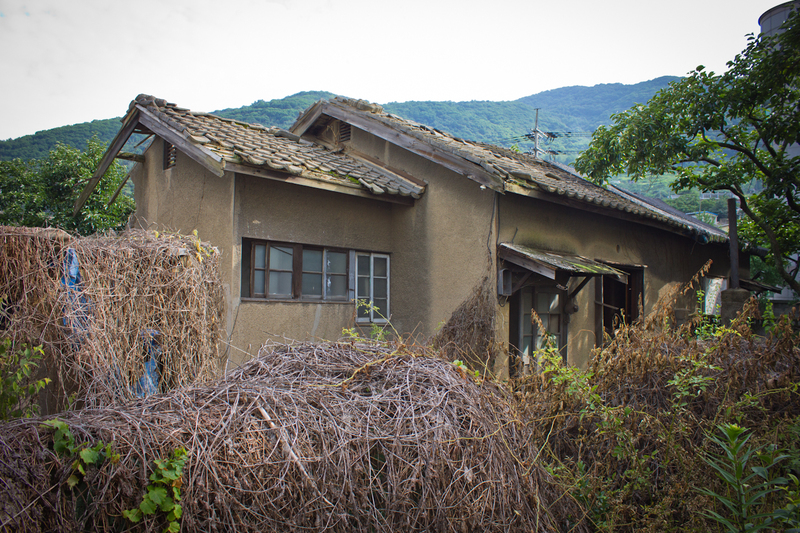 While the colonists did establish modern infrastructure, the deconstruction of the fortress town at Cheongdo is another tragic example of the kind of cultural destruction the Japanese government left behind. Further damage done to historical structures in the area at the hands of colonists include a 1,500 year old ice storage facility that was used until 1898, after which some of its stones were taken to build new bridges and foundations for other buildings.8 Tiny hanoks still litter the countryside, but the county’s most significant remaining structures seem to be near Cheongdo Station and the village cluster of Yuho-ri and Naeho-ri. The first structure around the Cheongdo Station area that deserves mention is a colonial era train tunnel. It was completed in 1904 and the only reason I’m not including photos of it in this blog are because it is a tourist trap.9 The tunnel is what Cheongdo is currently most known for as it was turned into a persimmon wine cellar in 2006. While it is probably one of the few tunnels that hasn’t had its interior bricks cemented over, I decided it wasn’t worth the hassle of dealing with the crowds to photograph it. You can find photos on a lot of blogs and tourist websites. 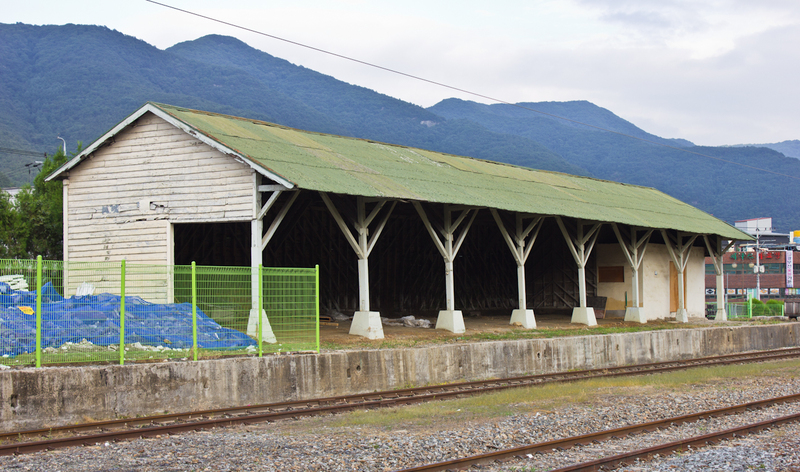 If you get to Cheongdo by train, the first early modern building you will see is a long, wooden structure with one open wall facing the tracks. 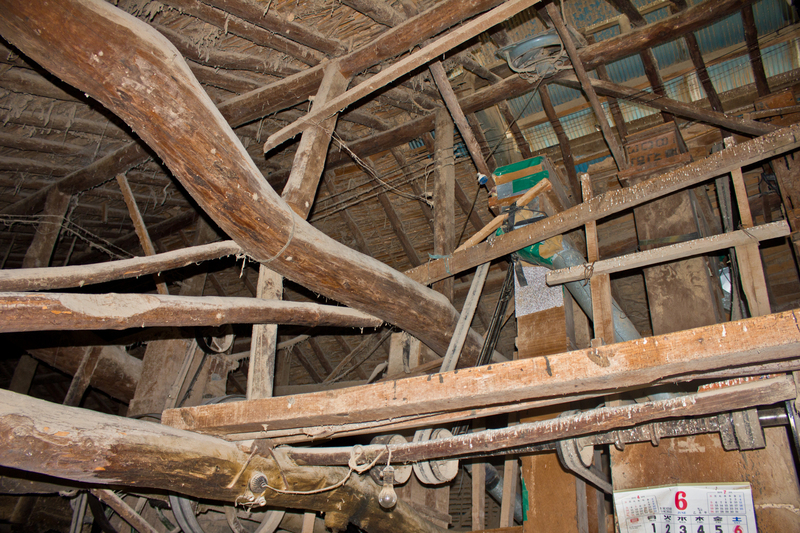 An overexposed photo below shows that the frame uses cross beams from seemingly uncut logs to support its walls. 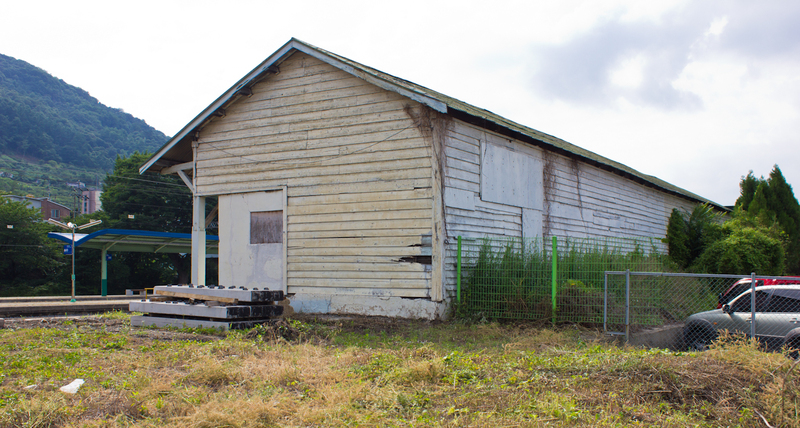 It is not of any particular historic value other than being one of the two last colonial rail way structures at the station. 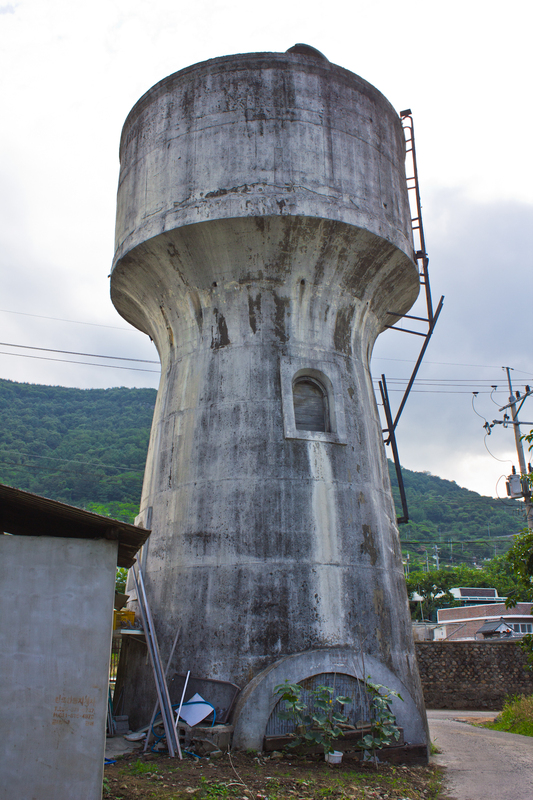 The next building is an old water tower on the other side of the tracks. It appears to be built entirely of concrete and neither of these structures appear to be under any kind of local or national government protection. In front of the station is one old early modern building. 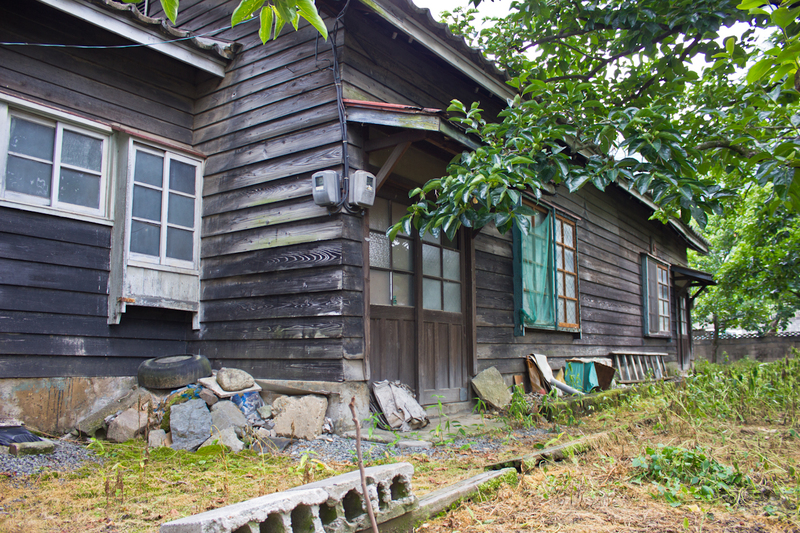 There are a couple of Japanese styled houses a block or two down the street (pictured below). One of them is falling apart and may have a newer cement facade. The other is in really good condition and has an interesting blend of red brick and wood paneling. Unfortunately, I haven’t been able to discover anything about their histories or who may have lived in them. Even more unfortunate is that both are also unprotected sites. Judging by the way they are kind of parallel to each other when looking at them on a map, it’s possible they were built together as a pair. They seem to have the same floor plans, same frame designs, and their northern facing exteriors both have the exact same window and door pattern – where the protruding end section has two square windows and a rectangular window followed by a door with a covered entry and next to a double window to its right. The first and third photos below illustrate this comparison well as the similarities are obvious. The three names above are actually all, more or less, the same area. 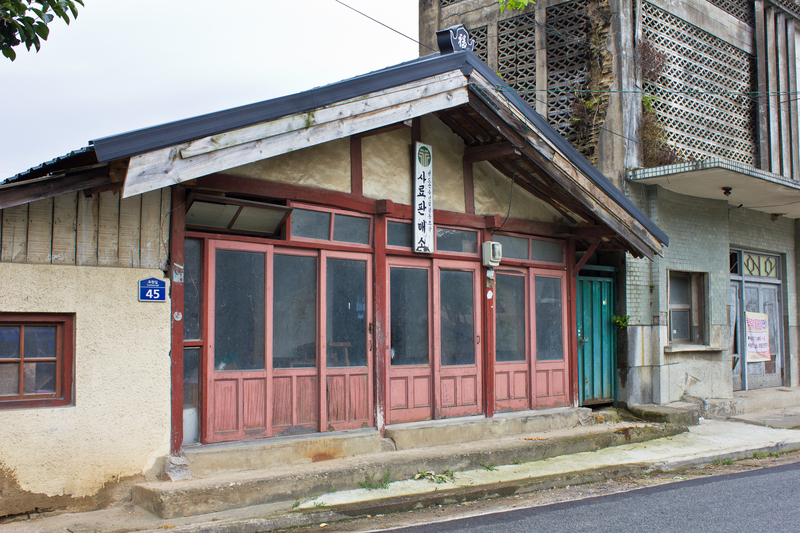 While Yuho-ri and Naeho-ri are actual administrative divisions, they were (and still are among the locals) collectively known as Yucheon. 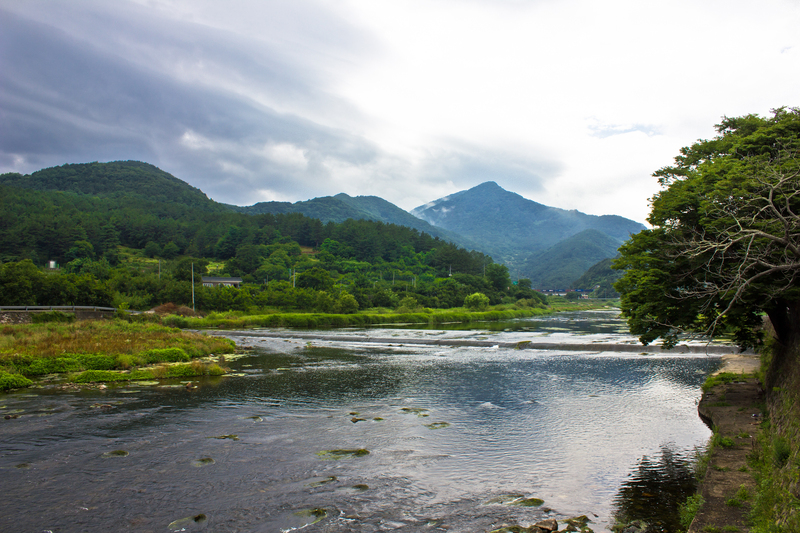 This is partially due to the post office, elementary school, and agricultural store that bear the Yucheon name.10 The Yuho-ri and Naeho-ri area is situated between Miryang and Cheongdo and is the meeting point of two rivers that feed the Miryang River. In this scenic river basin lie a handful of early twentieth century buildings. 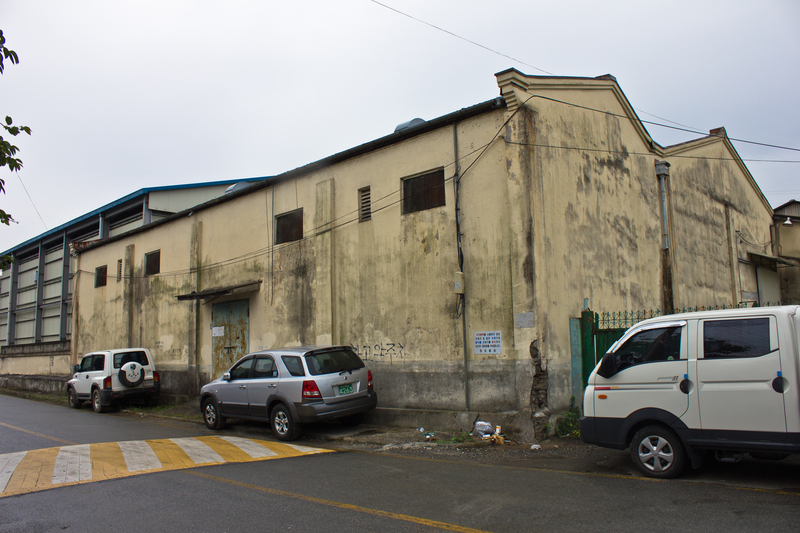 Further evidence of the area’s importance was the existence of lodging available to travelers and at least six breweries that operated sometime between 1915 and 1920.13 Locals also reportedly recall Yucheon Market, which occurred every second and fifth day, as being much larger than the markets in its sister cities of Cheongdo and Miryang.14 The community was built along the river, with its main street running parallel to it. 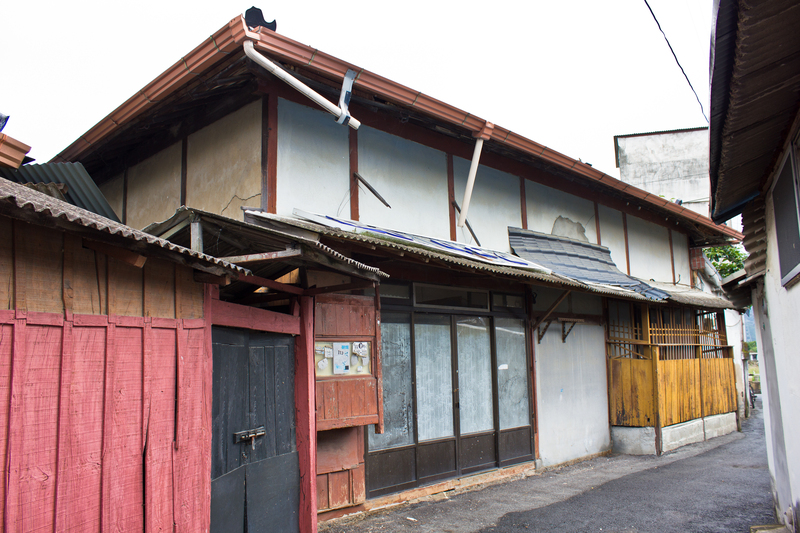 The area still retains a lot of its authenticity, which is made evident by its rows of early modern hanoks, Japanese styled shops and houses, a colonial era rice mill that is still in operation, a former brewery, and an old movie theater. The first half of the main street is neatly arranged in typical Japanese-Western fashion. Immediately visible from the mart that doubles as a bus stop, the town’s old movie theater juts up above the other roofs. Yucheon Theater is one of the simpler examples of modern architecture in Korea, and while it looks older than this to me, locals claim it was opened around 1970.15 The first floor exterior shows two small booths that probably served as ticket counters. It features a set of concrete “sails” that protrude from the second floor – a design that is also featured in the former Provincial Office in Daejeon. A series of semi-circular, half-moon concrete blocks were worked into the structure’s design. This kind of design is used all over the area and can be found in a lot of privacy walls. Like so many buildings across the Korean peninsula, at some point the theater caught fire, causing the roof to collapse (visible in the last picture below). According to the locals, it has sat vacant ever since. To the left of the theater is an old brewery that was one of the six in colonial era Yucheon to produce distilled spirits around 1915. 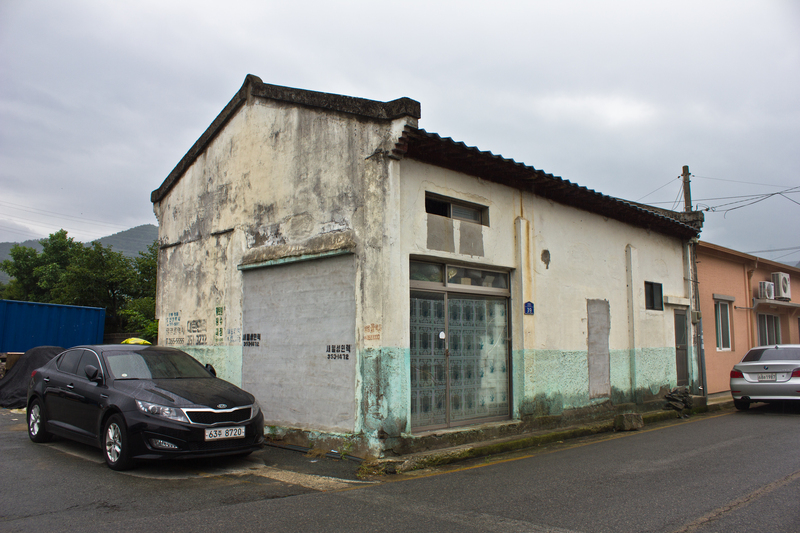 They were also known to have provided government agencies with their products during the Japanese occupation.16 This one specifically made soju, but others in the area also produced both soju and makgeolli. 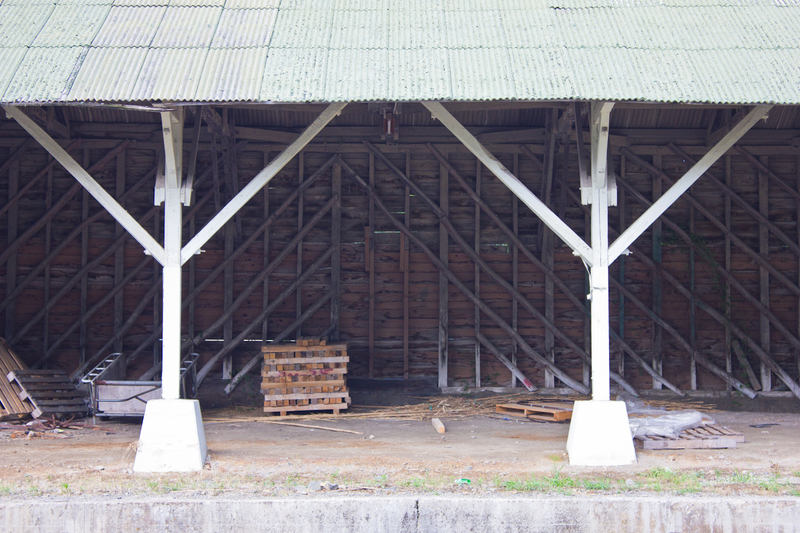 The building now serves as an animal feed store. 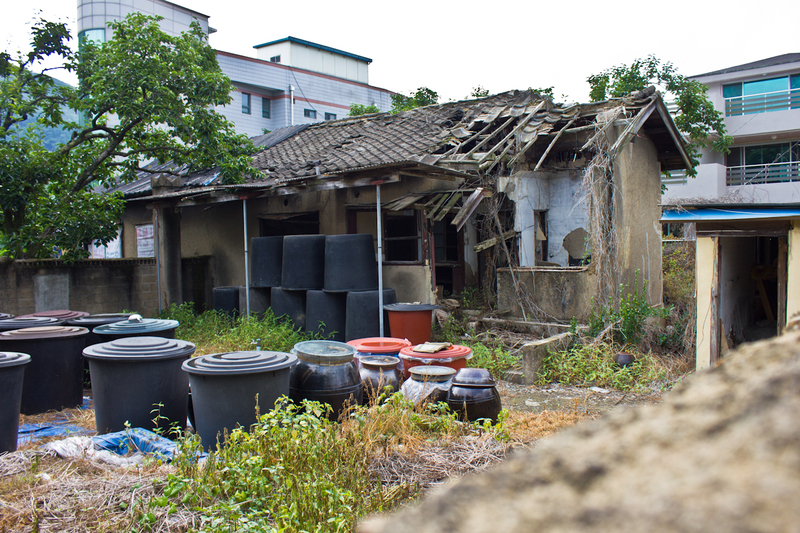 The Yeongsin Rice Mill is the livelihood of one man who inherited the structure as it was passed down from his grandfather, to his father, and then to him. 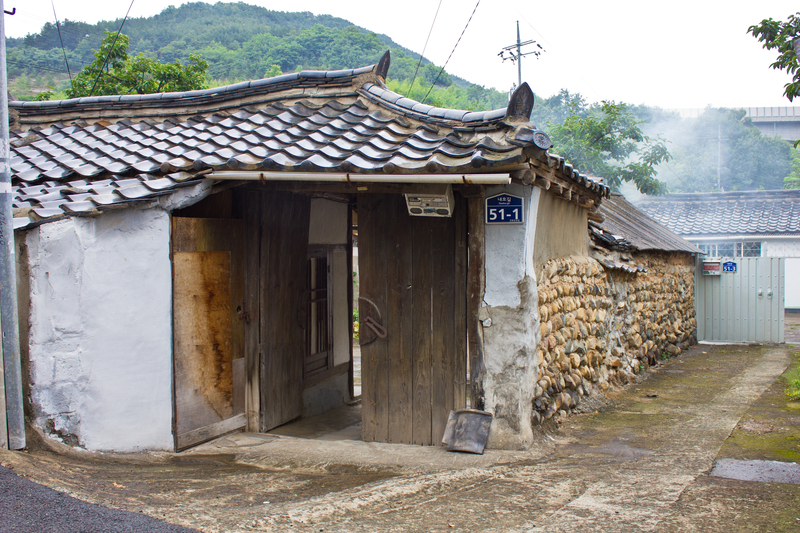 It bears mentioning here that during my visit, the owner gave the name Ko Jae-gyu (고재규). However, another source states the owner’s name as being Kim Mal-sun.17 It is likely that Ko Jae-gyu and Kim Mal-sun are husband and wife. 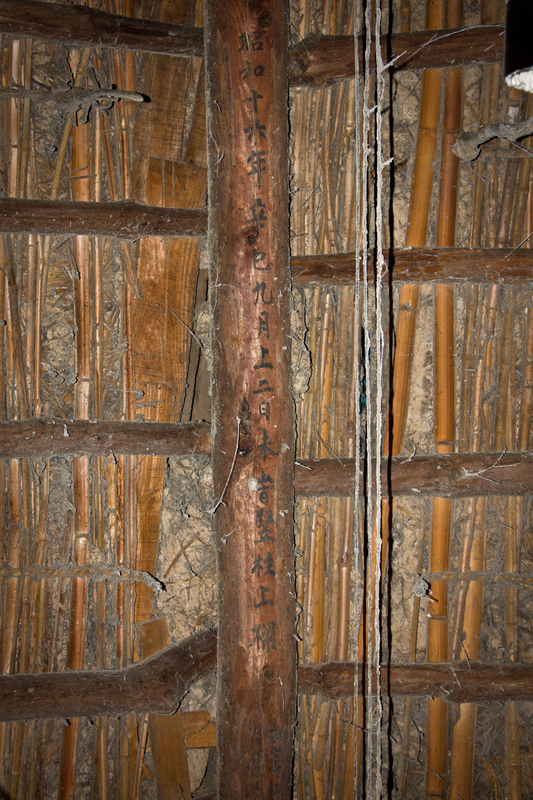 Dating to 1941, the structure has some information about it etched in Chinese in the center beam of the rafters. This means the mill has been in continuous operation for around seventy-five years. 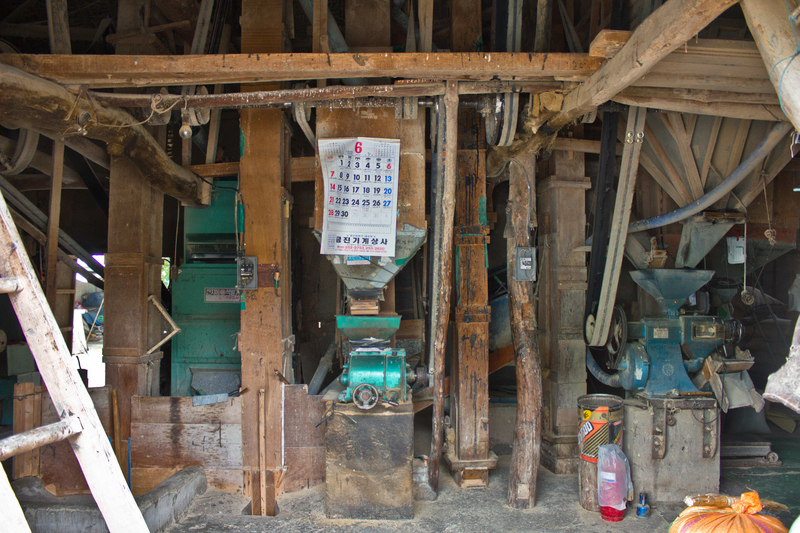 As you enter the structure from the street, you are greeted by three things: a giant calendar hanging on some really old mechanical machinery, piles of canvas rice bags, and lots of rice dust. 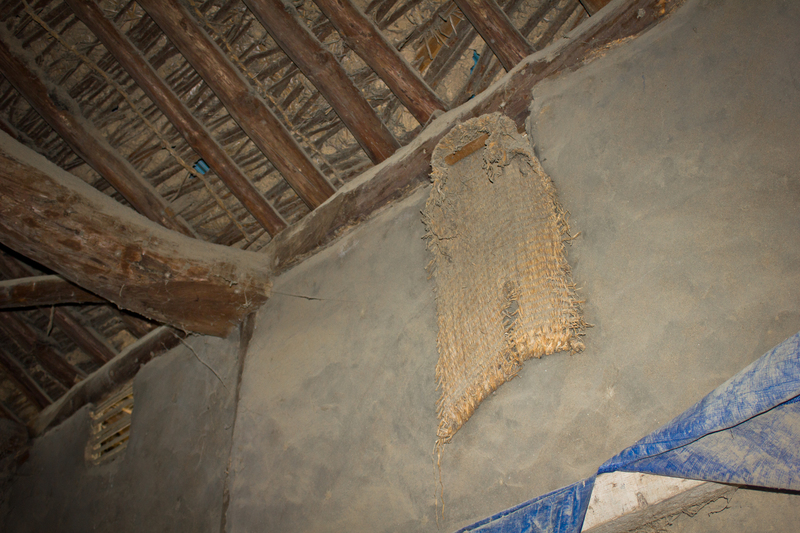 On one wall hangs a rice sifter made of bulrush reeds that looks so old it should probably belong in a museum. Sparrows fly in and out of the roof’s center vent, making the whole thing pretty picturesque. The equipment itself appears to be quite old, and Mr. Ko was kind enough to explain the history of the place as well as how the sifters, winnowers, etc, worked. “You should’ve come yesterday when the machines were running,” he said in Korean. Taped to the front of one machine is an old document from the government, an income report of some kind, that shows the rice mill’s rates from 1987 to 1991. 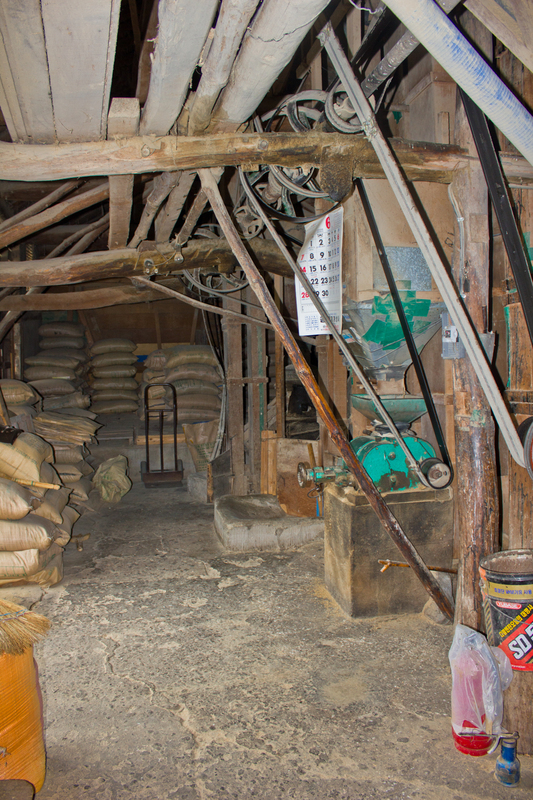 For example, in 1991, rice from this mill was being sold at 48,300 won per 40kg. 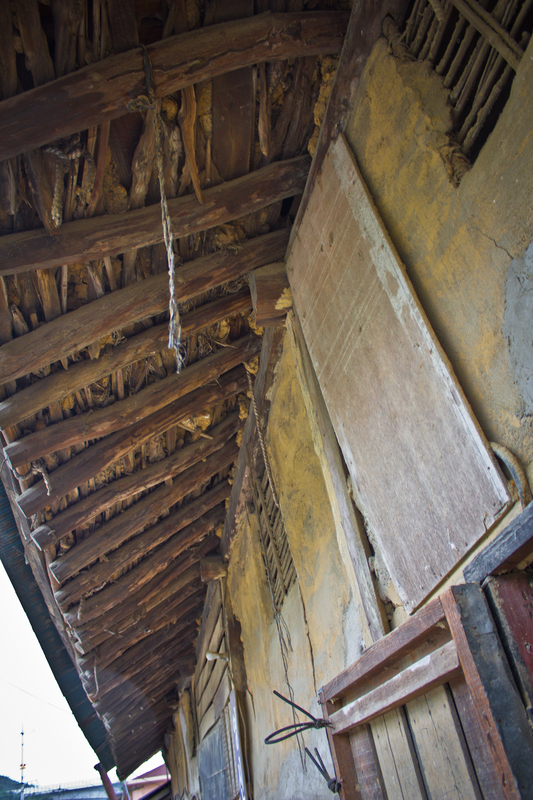 On close inspection of the structure, we see its walls were built like a hanok’s. Bamboo and wood were tied together in a grid and stuffed with mud before being plastered over with some heavy clay. The roof’s truss and supports, and indeed the structure’s frame in general, has been put together with timber that was never cut straight. While the mill has obviously stood the test of time, its interior frame does look rather haphazardly designed. 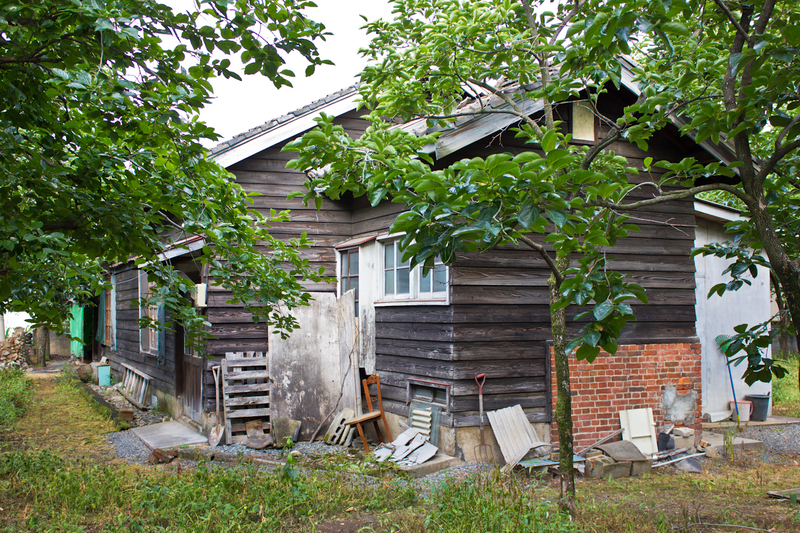 Nipponese architecture in the area shows that there was a Japanese community here. 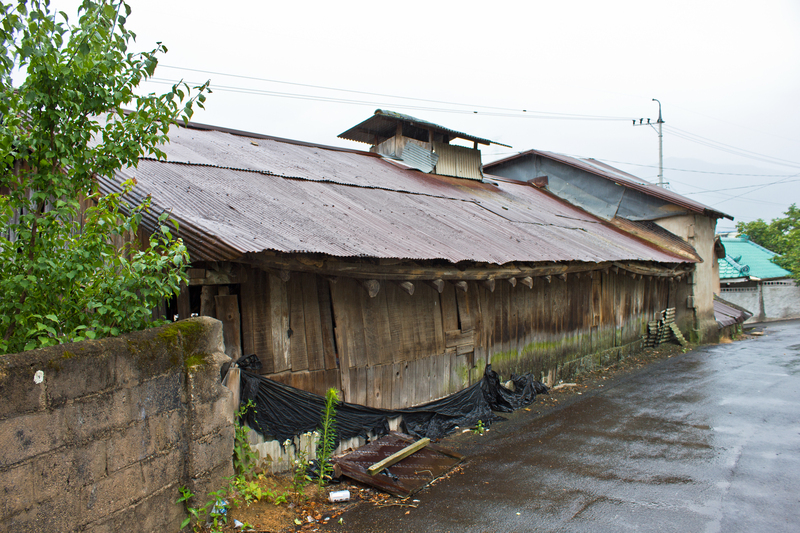 It is unclear how much influence the Japanese had in Naeho, but the fact that a Korean family owned and kept a rice mill for multiple generations is perhaps evidence that the village had less intrusion on the part of the Japanese when compared to other parts of Cheongdo. That being said, a lot of literature written about the colonial period in general focuses heavily on this aspect because land ownership is something that was well documented. For example, land surveying was carried out in Cheongdo after 1912 and a number of organizations were established by Japanese settlers to grow their influence.18 This included the Landlord Association, Cotton Farming Cooperative, Sericulture Cooperative, and various financial and industrial organizations.19 A 1920 agricultural production plan, perhaps implemented by the government, reorganized much of Cheongdo’s rural areas, resulting in a different economic structure that, directly or indirectly, put many Korean farmers at the bottom of the agricultural system with some of them losing their land.20 It is then significant that the Yeongsin Rice Mill’s owner’s grandfather held on to his business when other Cheongdo farmers were reduced to tenants. 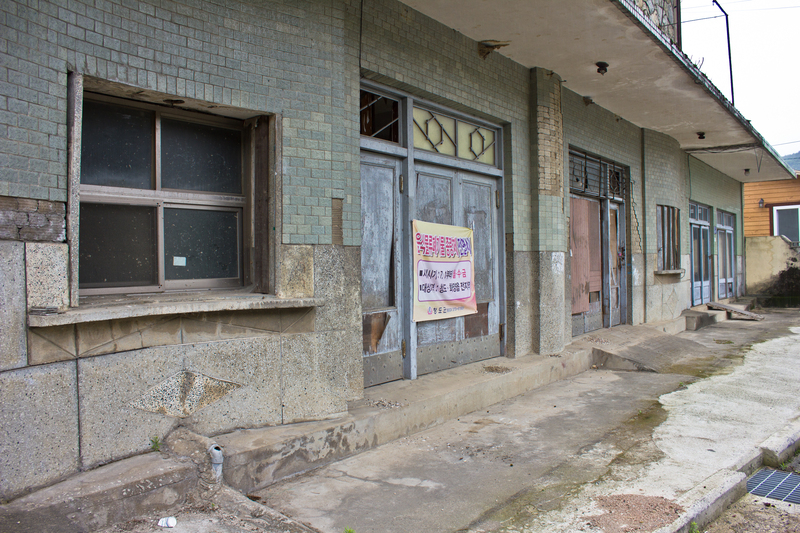 As seen in the previous photos of the movie theater, there is a one story colonial building between the rice mill and the theater, too. 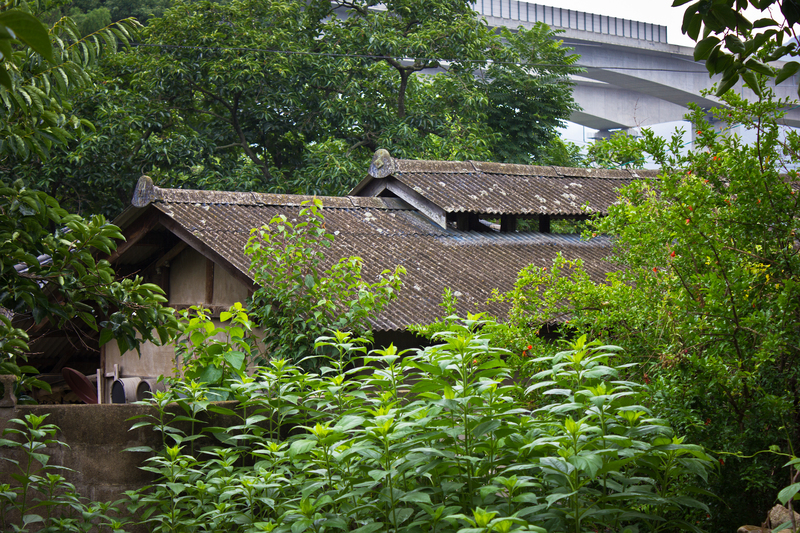 Across from the rice mill is the former house of Lee Ho Woo, a colonial period poet. 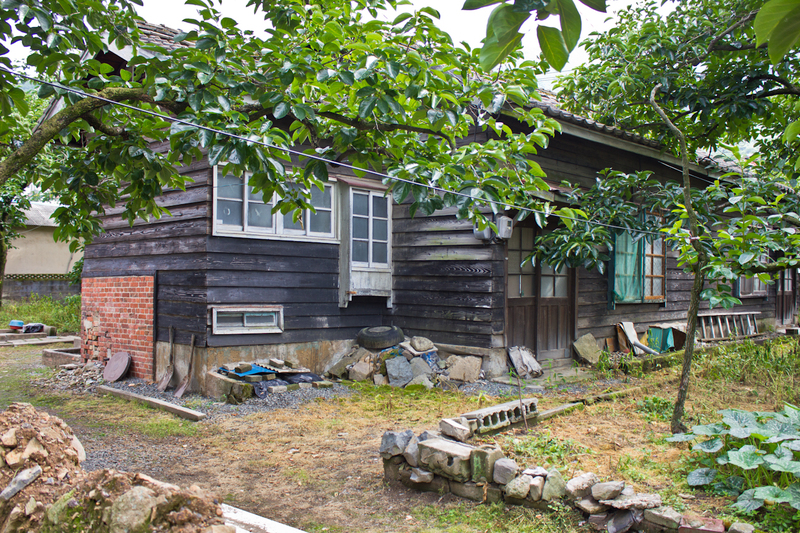 He lived in this house with his sister after its construction in 1910.21 The hanok was off limits behind a wall, but a quick peek showed that it was similar to other hanoks in the town. 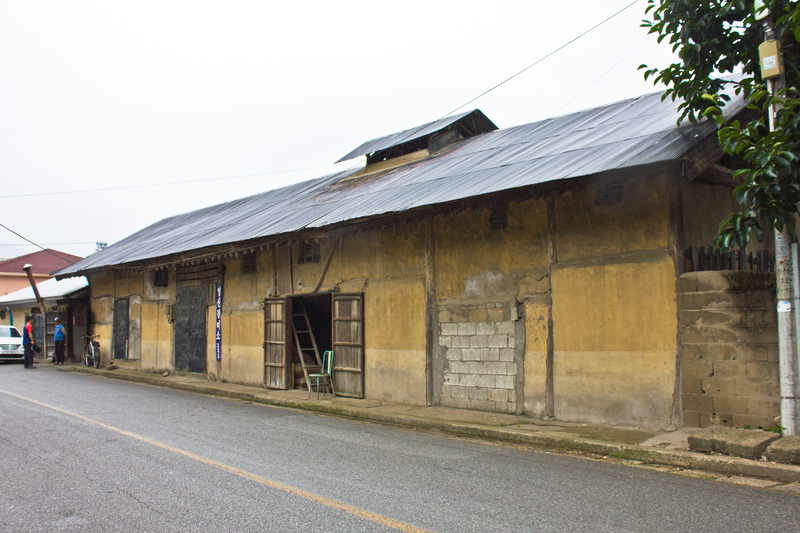 Just past the rice mill, on the same side of the street, are a couple of warehouse looking buildings, with the bigger ones still being used (pictured below). 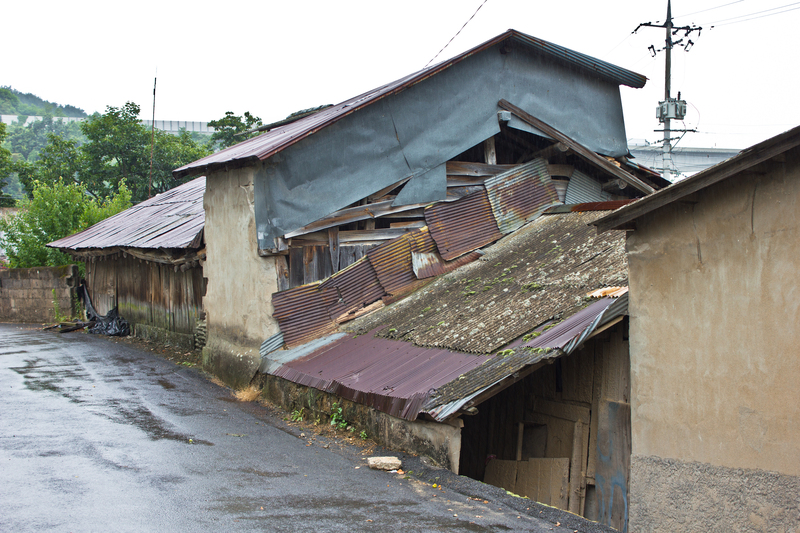 A couple of patched up, one story hanoks with newer metal roofs and cinder block walls sit across the street. 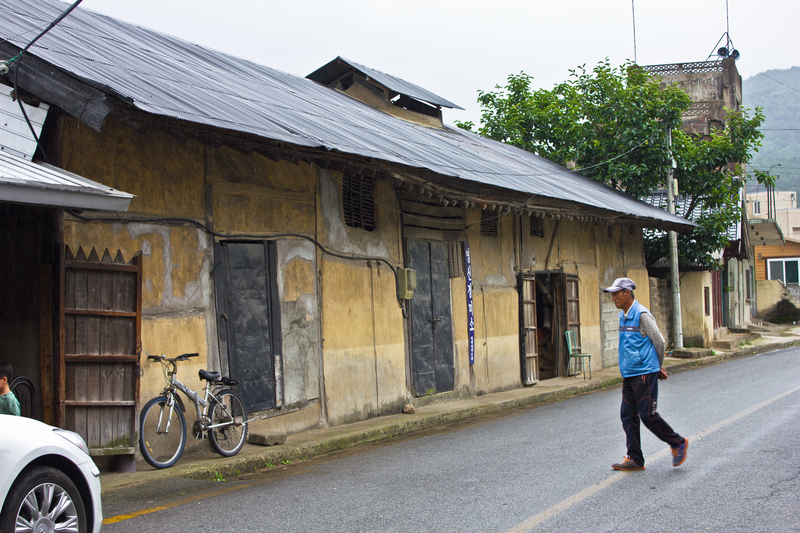 Walking up the hill, away from the main street, we begin to see the kind of hill side community that was typical of Korean villages. 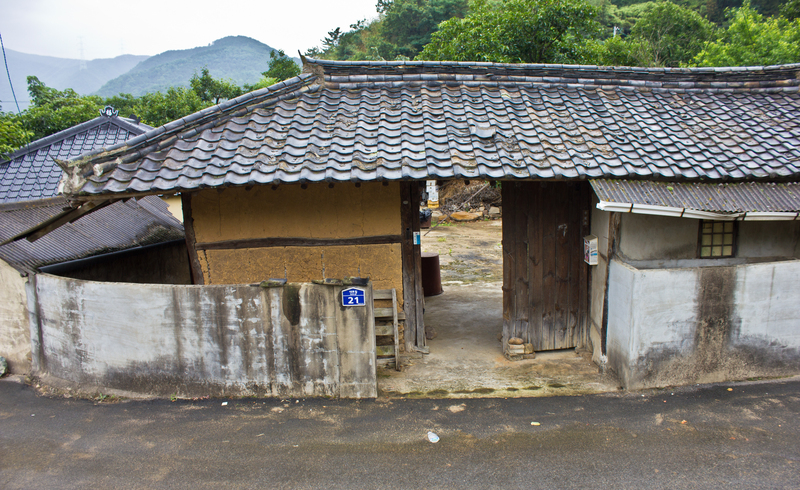 There are a number of old hanoks, some of which may even date to the end of the Joseon period judging by their stone walls. 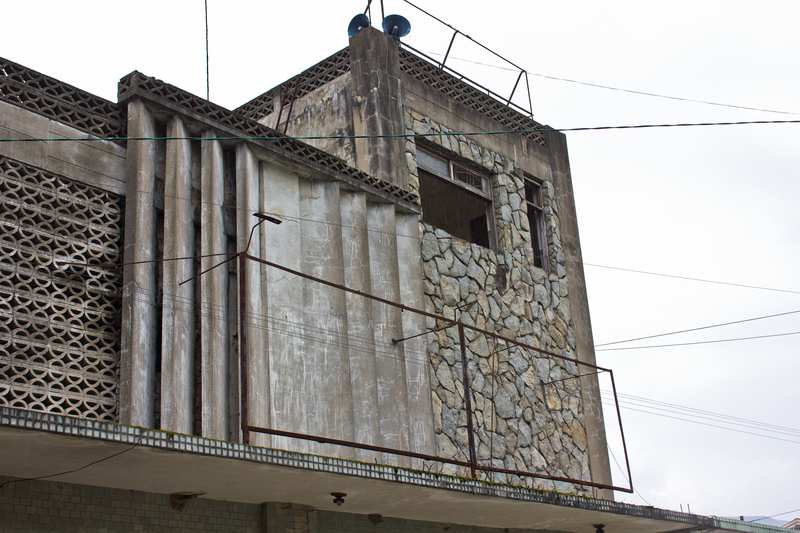 Another wood structure built in the same style as Yeongsin Rice Mill sits on one of the hill side roads in the the same section of town. Given its design, it would have also been a mill, factory, or warehouse of some kind. 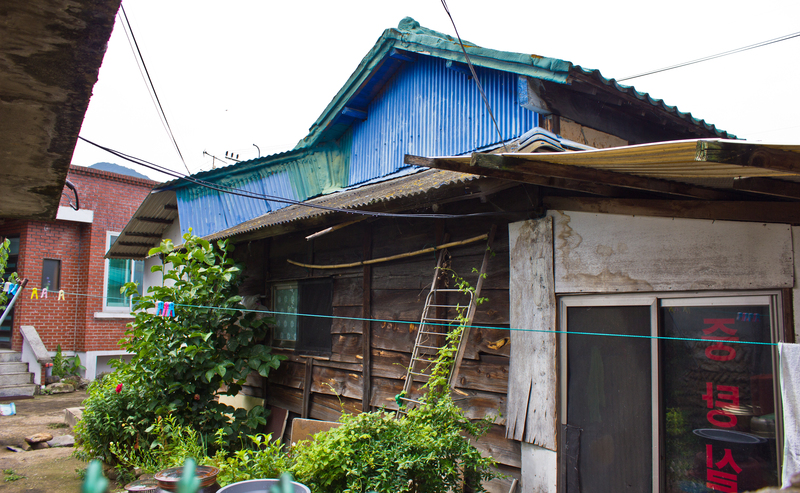 We can see how the vertically-laid plank walls are bursting at their seams, perhaps under the weight of the roof’s sagging frame, which was covered in metal sheeting at some point. Heading back towards the first part of Yucheon-gil we can see a few Japanese style structures. 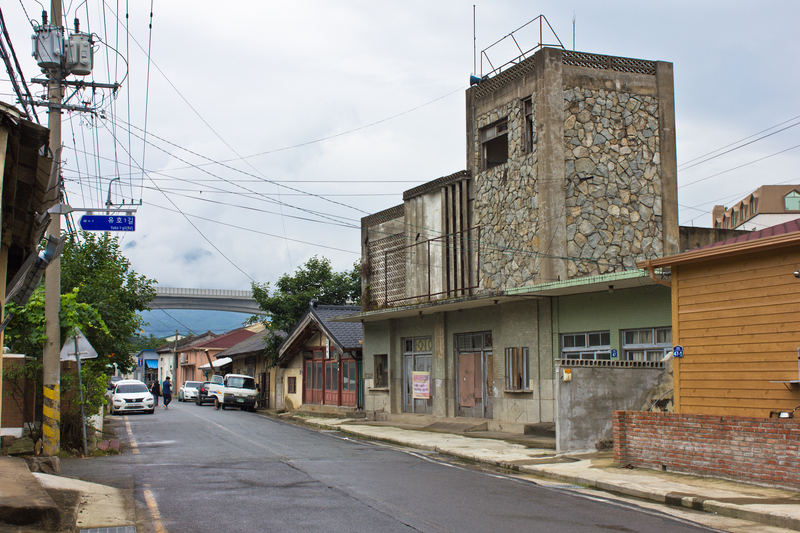 Many of these have new facades, but if you get behind them, you can see traces of their colonial origins. A street perpendicular to this one appeared to have some more of the same kind of early modern buildings, though I didn’t photograph them due to lack of time. The street that takes you over Yuho Bridge leads to Oksan-gil, a place that I noticed had a couple run down hanoks as I came in on the bus, but I didn’t have time to cross back over and photograph them. 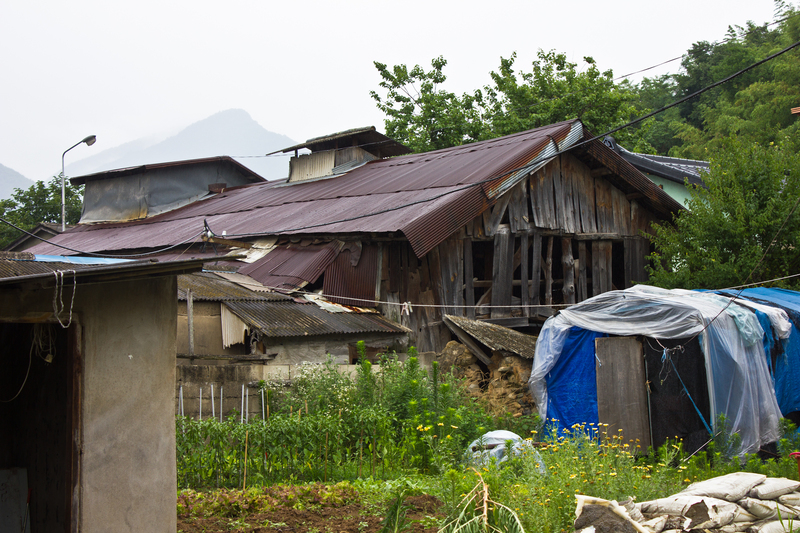 Naeho’s popularity waned in the 1970s after the construction of the new highway between Busan and Seoul.22 The road bypassed Naeho, destining the up-and-coming town to sit as a hamlet undeserving of even a township status. However, because it never developed any further than this, we now have a relatively well preserved mid-twentieth century modern community. 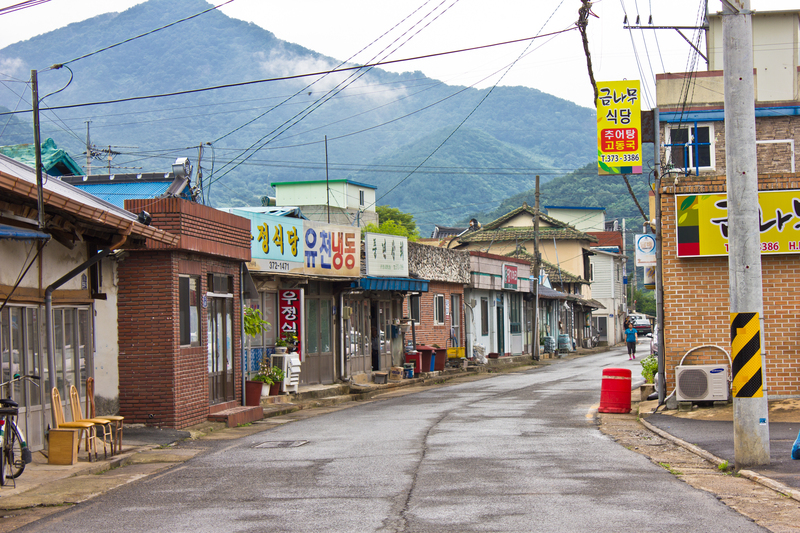 For those of us who only arrived in Korea a few years ago, it is the kind of place that can give us a more authentic representation of what Korean cityscapes of by-gone eras actually felt like to walk through. 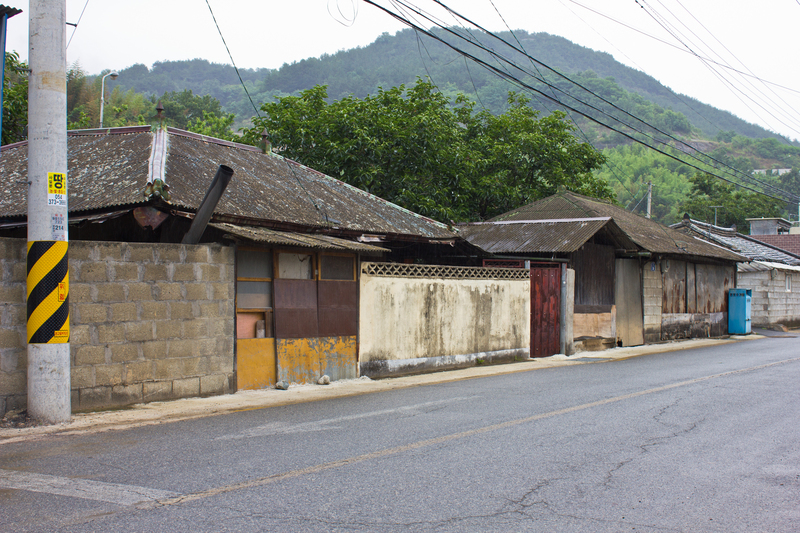 Villages like this are becoming increasingly rare and, unfortunately, none of the architecture in Naeho-ri (aside from the poet’s hanok) is under any kind of government protection. While it only takes about ten minutes to walk from one end of the main street to the other, it takes a little bit more time to get a bus from Cheongdo to Naeho-ri. In fact, depending on where you are coming from, you may spend more time traveling than in the village. Even from Busan, there are currently no more intercity buses running to Cheongdo so it seems the best way to get there is by train. As of summer 2015, a bus runs about every 40 or 60 minutes to Naeho-ri from the Cheongdo bus terminal. 1Gwan Daeung, “Japanese Colonial Period,” The Encyclopedia of Cheongdo-gun (The Academy of Korean Studies, 2013). 3Gwan Daeung, “Japanese Colonial Period,” The Encyclopedia of Cheongdo-gun (The Academy of Korean Studies, 2013). 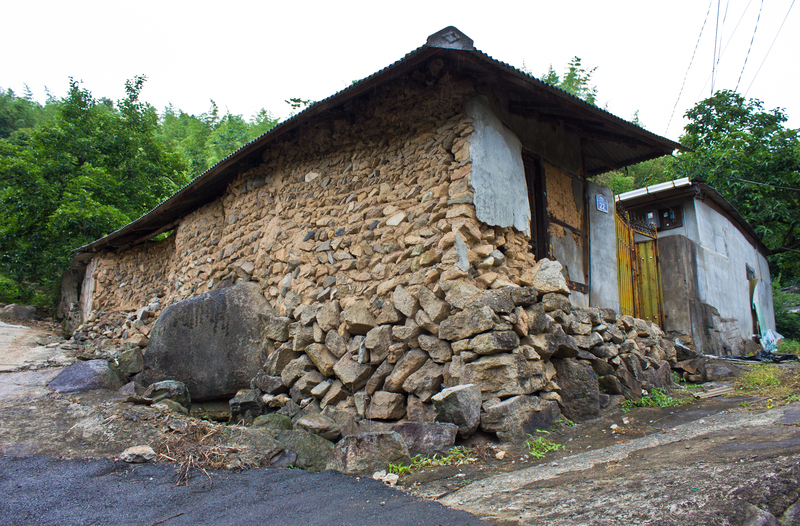 6Kim Chanyeong, “Cheongdoeupseong Fortress which is Restored by the Residents of Cheongdo-gun,” The Encyclopedia of Cheongdo-gun (The Academy of Korean Studies, 2013). 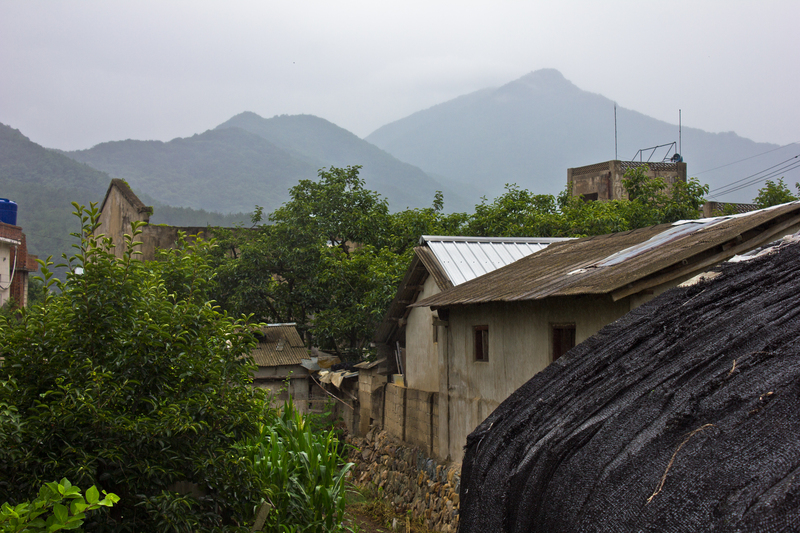 7Kim Chanyeong, “Cheongdoeupseong Fortress which is Restored by the Residents of Cheongdo-gun,” The Encyclopedia of Cheongdo-gun (The Academy of Korean Studies, 2013). 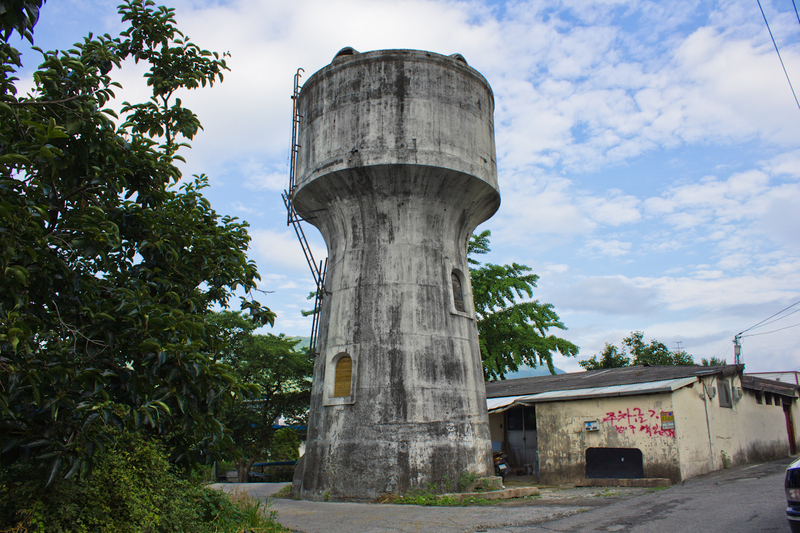 8Park Yunje, “Cheongdo Seokbinggo (Ice Storage),” The Encyclopedia of Cheongdo-gun (The Academy of Korean Studies, 2013). 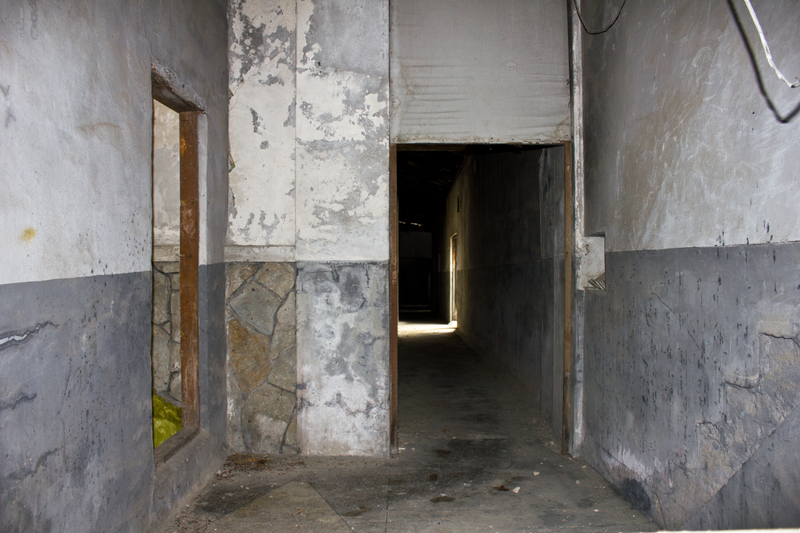 9Wine Tunnel, Cheongdo-gun Office (2013). 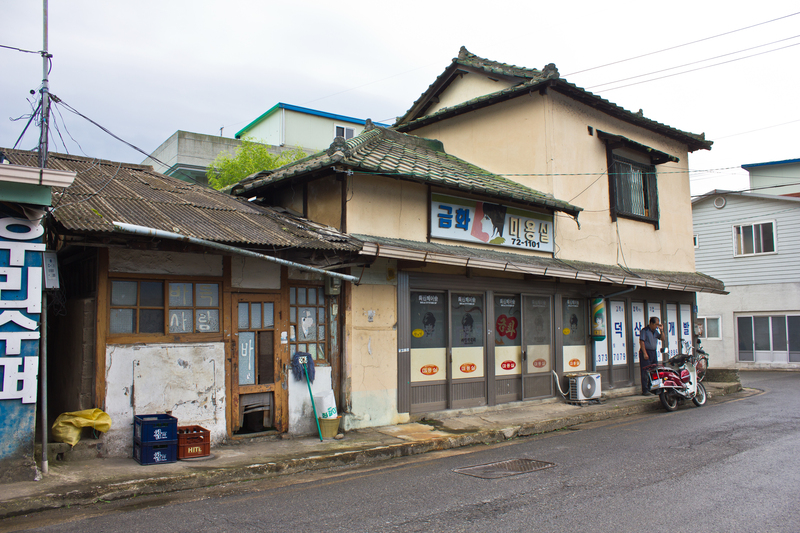 10Yeo Sugyeong, “Time Travel to Yucheon Village Located Between Cheongdo and Milyang: Modern and Contemporary Landscape,” The Encyclopedia of Cheongdo-gun (The Academy of Korean Studies, 2013). 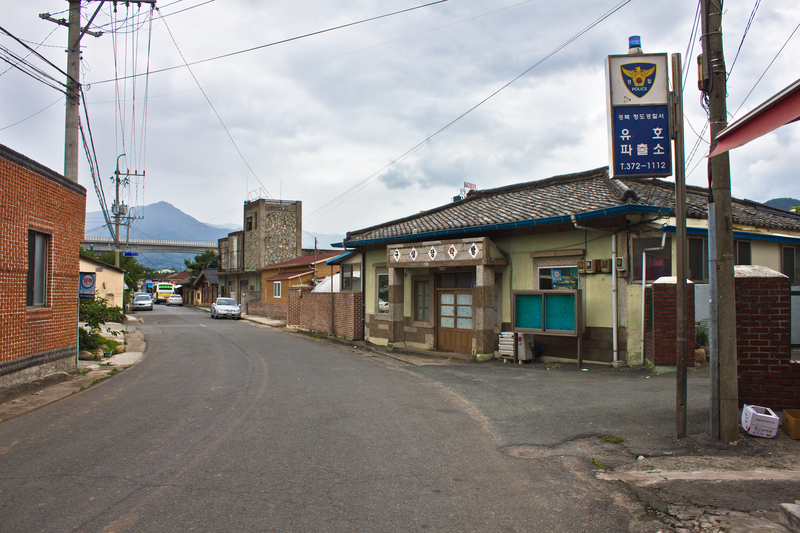 11Yeo Sugyeong, “Time Travel to Yucheon Village Located Between Cheongdo and Milyang: Modern and Contemporary Landscape,” The Encyclopedia of Cheongdo-gun (The Academy of Korean Studies, 2013). 12Yeo Sugyeong, “Time Travel to Yucheon Village Located Between Cheongdo and Milyang: Modern and Contemporary Landscape,” The Encyclopedia of Cheongdo-gun (The Academy of Korean Studies, 2013). 13Yeo Sugyeong, “Time Travel to Yucheon Village Located Between Cheongdo and Milyang: Modern and Contemporary Landscape,” The Encyclopedia of Cheongdo-gun (The Academy of Korean Studies, 2013). 14Yeo Sugyeong, “Time Travel to Yucheon Village Located Between Cheongdo and Milyang: Modern and Contemporary Landscape,” The Encyclopedia of Cheongdo-gun (The Academy of Korean Studies, 2013). 15Yeo Sugyeong, “Time Travel to Yucheon Village Located Between Cheongdo and Milyang: Modern and Contemporary Landscape,” The Encyclopedia of Cheongdo-gun (The Academy of Korean Studies, 2013). 16Yeo Sugyeong, “Time Travel to Yucheon Village Located Between Cheongdo and Milyang: Modern and Contemporary Landscape,” The Encyclopedia of Cheongdo-gun (The Academy of Korean Studies, 2013). 17Yeo Sugyeong, “Time Travel to Yucheon Village Located Between Cheongdo and Milyang: Modern and Contemporary Landscape,” The Encyclopedia of Cheongdo-gun (The Academy of Korean Studies, 2013). 18Gwan Daeung, “Japanese Colonial Period,” The Encyclopedia of Cheongdo-gun (The Academy of Korean Studies, 2013). 19Gwan Daeung, “Japanese Colonial Period,” The Encyclopedia of Cheongdo-gun (The Academy of Korean Studies, 2013). 20Gwan Daeung, “Japanese Colonial Period,” The Encyclopedia of Cheongdo-gun (The Academy of Korean Studies, 2013). 22Yeo Sugyeong, “Time Travel to Yucheon Village Located Between Cheongdo and Milyang: Modern and Contemporary Landscape,” The Encyclopedia of Cheongdo-gun (The Academy of Korean Studies, 2013). *I use the terms Nippon and Nipponese in the way that Imperial Japan itself and Western scholars of Asia would at that time. I’m fully aware that these are now outdated, and to some people, borderline pejorative, terms. However, they’re included here for texture and descriptive purposes. *Kudos to the Academy of Korean Studies, the local Cheongdo government, and these article contributors for providing a great searchable online encyclopedia for English speakers.